Meaningful Movement: a weekend course exploring the techniques to effectively articulate yourself through puppetry and developing original material to tell your own stories. 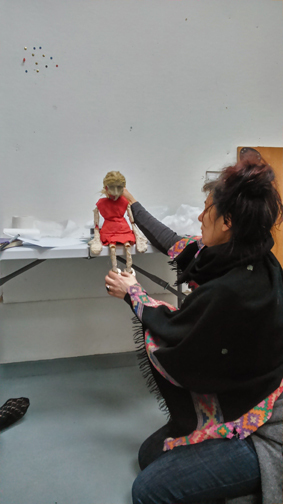 Lead by Darren East and Isobel Smith, this course will share a number of ways into making strong, emotionally truthful, visual material with puppets. From technical and analytic methods to exploratory, open-ended discovery, puppetry lends itself to drawing on a wide range of creative approaches. This short course will help you find the ones that work best for you, and give you confidence to use them effectively. 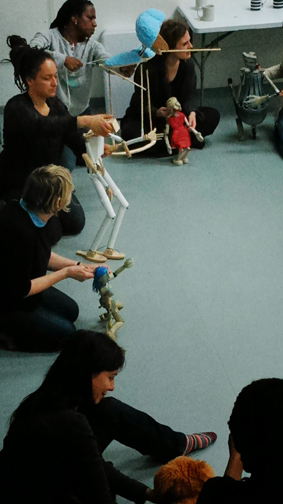 You will leave with a rich toolbox of ways to make powerful puppetry performance material, and developed puppetry skills for putting it into action. There will be some space to apply your new skills to a puppetry project you have in mind, and/or with your own puppets. This course is most suited to people with some experience of puppetry, or with ideas of ways they would like to use puppets. Keen beginners are also welcome. “Tons of great technique, skills, ideas and practical advice about manipulating puppets, performance, meaning etc. So good! “I loved the practice we had with different processes using bags / own puppets / other’s puppets. Other’s feedback also really useful + other’s eyes on our process. “I think it was brilliantly pitched. I didn’t know this was your first – (You’d never guess!). Great support + empathy + feedback. Can’t wait to do more work with you guys in future. “Voice and how it relates was amazing. Open honest feedback space felt safe and constructive. Opportunity to try different puppets.